a pie into someone’s face. Actually I can! For my dad’s 60th birthday we staged a huge pie fight! SO FUN! My dear old dad LOVED the pie in the face prank. Click to see pie in the face + my dad + the wonderful Oakland A’s. Speaking of baseball, PEOPLE, IF YOU HAVEN’T MADE IT TO A GAME THIS SEASON, WHAT ARE YOU WAITING FOR?? I typed that in all caps accidentally, but I’m not changing it! It’s also Knit in Public Week. And if you were to knit in a lobby you’d be killing 2 birds with 1 stone (2 birds with 1 stone sounds so mean! How about we try to get 2 candy bars in 1 wrapper to take its place? ), because it is also Hang Out in a Lobby Day (There’s a slight chance that Lobbyists’ Day is actually meant to honor political lobbyists, but I like my interpretation better, i.e. that someone who hangs out in a lobby is a lobbyist,). Happy birthday to Jackie Wilson (1934), T.D. Jakes (1957), Cole Porter (1891), Johnny Depp (1963), Donald Duck (1934), and Michael J. Fox (1961). I had a crush on one of these famous men. Can you guess which? And speaking of Donald Duck (no my crush was not for Donald! ), I never realized he was actually saying words until I was a grown up and someone pointed it out to me. I’d always thought he was just making a great big quacking blustery commentary on the frustrations of his life. And that if humans could understood Donald’s duck-speak, he’d have to be rated R for naughty language! BTW, the Smileys and holidays on a month full of Smiley Silliness are all different than the ones you see here on the website’s Daily Smiley. There we celebrate Salad Day. I have a salad eating cat. No lie. Mr. Noodle loves salad. He’s 18 years old, proving it must be good for him. 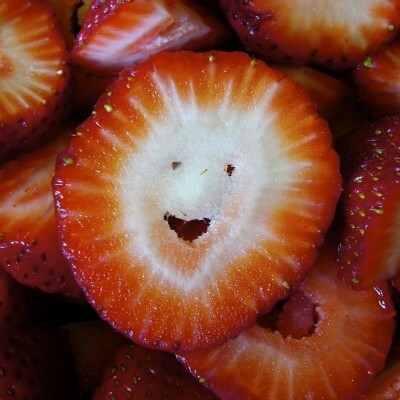 Plus, as is often the case, the Strawberry Smiley you get in the Smiley-a-Day emailer is different from what you see here.